This article is about the episode of the TV series. For the novel upon which it is partially based, see A Dance with Dragons. "The Dance of Dragons" is the ninth and penultimate episode of the fifth season of HBO's fantasy television series Game of Thrones, and the 49th overall. 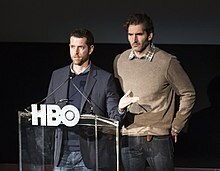 The episode was written by the series' creators David Benioff and D. B. Weiss based on material primarily found on George R.R. Martin's novel A Dance with Dragons, from which the title of the episode is derived. It was directed by David Nutter, who also directed the season finale. In the episode, Jon Snow retreats from Hardhome to the Wall defeated, accompanied by the surviving wildlings, much to the chagrin of some of the Night's Watch. In the North, Stannis Baratheon reluctantly allows Melisandre to sacrifice his daughter Shireen after Ramsay Bolton sabotages his resources, damaging his army's morale in the process. In Braavos, Arya Stark detours from her mission given by Jaqen H'ghar to reconnoiter Meryn Trant instead. In Dorne, Jaime Lannister secures Myrcella Baratheon's release from Doran Martell's court against an indignant Ellaria Sand. In Meereen, the Sons of the Harpy attack the stadium of Daznak's Pit in an attempt to assassinate Daenerys Targaryen, who is rescued by Jorah Mormont and her firstborn dragon, Drogon. Leaving Tyrion Lannister and her retainers behind with awe, Daenerys rides the dragon for the first time and flees the city. "The Dance of Dragons" received a positive response from critics, who lauded its conclusion on Daznak's Pit but was polarized by the characterization of Stannis Baratheon. In the United States, it received a viewership of 7.14 million in its initial broadcast. It won two Primetime Creative Arts Emmy Awards for Outstanding Single-Camera Picture Editing for a Drama Series and Outstanding Special Visual Effects, and was submitted by actress Emilia Clarke (who portrayed Daenerys Targaryen) for her nomination for a Primetime Emmy Award for Outstanding Supporting Actress in a Drama Series. Arya, still in the disguise of an oyster vendor, continues the mission given to her by Jaqen to poison and kill the Thin Man. However, as she is on the way to her target, she sees Mace Tyrell and Meryn Trant arrive in the harbor to negotiate payment terms with the Iron Bank. Arya, recognising Trant, ignores her mission and follows Mace and Trant into the city. She eventually tracks Trant to a brothel, where she learns that he is sexually attracted to pubescent girls. Upon returning to Jaqen, Arya lies to him by telling him the Thin Man was not hungry and did not buy her oysters, and asks to try again the next day. Jaqen allows this, though it is unclear whether he believes Arya or not. Jon and Tormund return to Castle Black, accompanied by the surviving Night's Watch and wildlings from Hardhome. Thorne, despite his disagreements with Jon, ultimately orders the gate to be opened to let them pass. Jon believes that his mission was a failure, though Samwell points out that he still saved thousands of wildlings that would have been killed by the White Walkers. Jon is also aware that many of his Night's Watch brothers are unhappy with wildlings being let past the Wall, and Alliser warns him that his compassion will get them all killed. Jaime is brought before Doran to explain his actions. Jaime reveals that he was sent to rescue Myrcella due to a threatening message sent to them from Dorne. Doran quickly realizes that Ellaria was behind the threat, and apologizes. In order to avoid an escalation of hostilities, Doran negotiates a deal with Jaime. In return for Jaime's freedom and Myrcella's return to King's Landing, the Lannisters must allow Trystane to accompany them as Oberyn's replacement on the Small Council. Trystane also allows Bronn to go free under the condition that he allow Hotah to strike him in the face in revenge for being struck by Bronn earlier. After the meeting, Doran privately confronts Ellaria and presents her with an ultimatum: pledge loyalty to him or be executed. Ellaria tearfully pledges her loyalty in front of the Sand Snakes, and Doran warns her that this is the last chance he will ever give her. Ellaria then meets with Jaime and makes amends with him, conceding that it is neither his nor Myrcella's fault that Oberyn was killed. Ramsay and his group of 20 men infiltrate Stannis' camp and sabotage the supplies by burning them. With his supplies gone, Stannis realizes that his army will not survive the winter. Davos recommends they retreat back to Castle Black, but Stannis refuses to retreat, and points out that they lack the supplies to make it back regardless. He orders Davos to return to Castle Black to request more supplies and reinforcements in return for Stannis fully manning the Wall with troops when he takes the Iron Throne. When Davos leaves, Stannis reluctantly allows Melisandre to burn Shireen at the stake as a sacrifice, believing that the "king's blood" in her veins will please the Lord of Light, who will then change their fortunes. As Shireen screams for her parents, Selyse, initially supportive of Stannis's decision, has a change of heart and attempts to stop the ceremony, but is restrained while her child is burned alive in front of Stannis' horrified troops. Daenerys, accompanied by Tyrion, Missandei, Daario and Hizdahr, oversees the beginning of the fighting season in Daznak's Pit. One of the fighters reveals himself to be Jorah. After successfully defeating the other combatants, Jorah suddenly picks up a spear and throws it towards the royal stage, killing an assassin sneaking up on Daenerys. Immediately, the Sons of the Harpy emerge from the crowd and begin killing many guards and spectators, including Hizdahr. Daenerys and her retinue attempt to escape, but the Sons of the Harpy seal the exits, leaving the survivors surrounded and trapped in the center of the fighting ring. Daenerys seemingly accepts her fate, when she hears Drogon roaring nearby. Drogon suddenly appears, setting ablaze and killing many Sons of the Harpy, causing some to flee. While a group of the Sons attack Drogon by throwing spears at it, Daenerys climbs on to Drogon's back, ordering the dragon to fly. The Unsullied drive the Sons of the Harpy away, while Drogon takes to the sky with Daenerys, with her allies left awe-struck as they watch her fly away. This episode was written for television by David Benioff and D. B. Weiss, the series' creators. It contains content from George Martin's novel A Dance with Dragons, chapter "The Sacrifice", "The Watcher", and "Daenerys IX". It also contains material from the preview chapter "Mercy" from the forthcoming The Winds of Winter. Like other episodes this season, "The Dance of Dragons" contains original content not found in Martin's novels, but it is in this case notable for containing content that had not yet appeared in the novels: Executive Producers David Benioff and D.B. Weiss confirmed that George R.R. Martin told them that Shireen would be burned to death as a sacrifice in an unpublished future novel. Benioff said: "When George first told us about this, it was one of those moments where I remember looking at Dan, it was just, like, god it's so, so horrible, and it's so good in a story sense, because it all comes together." Weiss says he believes the decision to kill Shireen in this way is, "entirely [narratively] justified," questioning why "we're all highly selective about which characters deserve our empathy. Stannis has been burning people alive for seemingly trivial reasons since season 2." "The Dance of Dragons" was directed by David Nutter, he also directed the subsequent episode, "Mother's Mercy". "The Dance of Dragons" was watched by an estimated 7.14 million American viewers during its first airing. With Live+7 DVR viewing factored in, the episode had an overall rating of 9.92 million viewers, and a 5.2 in the 18–49 demographic. In the United Kingdom, the episode was viewed by 2.473 million viewers, making it the highest-rated broadcast that week. It also received 0.141 million timeshift viewers. "The Dance of Dragons" received highly positive reviews, with many critics praising the episode's conclusion in Daznak's Pit. The showrunners' decision to have Stannis sacrifice Shireen, however, polarized critics, with some praising it as strong character development and others feeling it betrayed Stannis's character. The episode received a rating of 88% on the review aggregator Rotten Tomatoes from 33 reviews with an average rating of 8.9 out of 10 and the critics consensus reading "Underscored by an especially heartwrenching moment and a spectacular display of power, The Dance of Dragons successfully delivers the shock and awe audiences have come to expect from the series' penultimate episodes." Matt Fowler of IGN heavily praised the episode, awarding it 9.3/10, an "amazing" score. He especially praised the episode's final act, stating "And just the spectacle of Dany climbing on top of Drogon, with care, and then soaring up and off into the sky was remarkable. It's funny that a huge moment for her as a Targaryen and the possible future leader of Westeros came right during one of her most bloody and spectacular failures as a Queen." He summarized his review by saying "GoT delivered another exciting (and unsettling) episode as Stannis made a big decision & Daenerys attended a tournament" and labelled Stannis' decision a strong point of the episode. Charlotte Runcie of The Daily Telegraph also reviewed the episode favorably: "Hurling Hollywood-level budgets behind a multi-season TV show paid rich rewards this week, from the enormous Gladiator-style sweep of the crowded coliseum arena to thrillingly choreographed fights to the death before a huge, baying audience." Runcie was also impressed with the Shireen sacrifice scene, calling it "one of the most upsetting scenes" in season 5. Writing for The A.V. Club, both writers responded positively to the episode. Writing for people who have not read the novels, Brandon Nowalk awarded the episode an A-, praising Stannis' sacrifice of Shireen. He said "Stannis burning his daughter Shireen at the stake is the hardest Game of Thrones has hit since the Red Wedding, only this violence is completely drained of excitement. It’s not a shock moment, and there’s no gross-out gore as in Oberyn’s death. Instead it’s a long, cold death march. What’s most impressive is the pacing, which is not the season’s strongest suit." He also praised the episode's conclusion in Meereen by saying "The close-up of Dany taking Missandei’s hand is so vivid I’m practically getting misty now", and further stated "The CGI could use some polish, but nothing short of Shireen can turn my smile upside down." Writing for people who have read the novels, Myles McNutt awarded the episode a B+, praising the Meereen story by saying "It’s a powerful image, rendered as effectively as it could be given the budgetary limitations of the series. Watching Dany soar about the stadium on Drogon is an iconic image, but it’s not one that any other characters could really experience, which is meaningful in and of itself." Erik Kain of Forbes was more critical of the sacrifice scene. While he praised the episode overall as "thrilling and tragic and intense," he called the sacrifice scene "a horrible, no-good, very bad, infuriating way to ruin Stannis as a character" and "a monstrosity of a writing decision." He also said the scene was "one of the most disturbing, baffling, and unnecessary departures from the books" that the show has so far presented, though he noted that the sacrifice scene had actually been George R. R. Martin's idea and that (with two installments of The Song of Ice and Fire still unpublished) it was unclear exactly how much Shireen's death in the show would deviate from her story arc in the books. Finding a middle ground, Alyssa Rosenberg of The Washington Post agreed that the sacrifice scene was disturbing, but she found that David Nutter "did a beautiful job" directing it and believed that the scene wondrously developed Stannis as a character who is so fixated on "his own chosenness" that he will do anything to fulfill his claim to the throne. She also noted that the scene departed from the books so far, but would possibly be reconciled in one of the future installments. ^ Garcia, Elio; Antonsson, Linda (June 8, 2015). "EP509: THE DANCE OF DRAGONS". Westeros.org. Retrieved June 9, 2015. ^ "Game of Thrones Season 5: Inside the Episode". Game of Thrones. Season 5. Episode 9. June 7, 2015. HBO. Retrieved June 9, 2015. ^ Hibberd, James (June 7, 2015). "Game of Thrones showrunner analyzes that very disturbing death scene". Entertainment Weekly. Retrieved June 7, 2015. ^ Bibel, Sara (June 22, 2015). "'Game of Thrones' Leads Adults 18-49 & Viewership Gains, 'Halt & Fire' & 'Salem' Top Percentage Increases in Live +7 Cable Ratings for Week Ending June 7". TV by the Numbers. Retrieved June 22, 2015. ^ "Top 10 Ratings (8-14 June 2015)". BARB. Retrieved April 7, 2016. ^ "Did 'Game of Thrones' Go Too Far With Latest Death?". The Hollywood Reporter. Retrieved 2016-05-21. ^ Fowler, Matt (June 8, 2015). "Game of Thrones: "The Dance of Dragons" Review". IGN. Retrieved June 8, 2015. ^ Runcie, Charlotte (June 8, 2015). "Game of Thrones: The Dance of Dragons, season 5 episode 9, review: 'new depths of brutality'". The Telegraph. Retrieved June 8, 2015. ^ Nowalk, Brandon (June 8, 2015). "Game of Thrones (newbies): "The Dance Of Dragons"". The A.V. Club. Retrieved June 8, 2015. ^ McNutt, Myles (June 7, 2015). "Game of Thrones (experts): "The Dance of Dragons"". The A.V. Club. Retrieved June 8, 2015. ^ Kain, Erik (June 8, 2015). "'Game of Thrones' Season 5, Episode 9 Review:The Dance of Dragons". Forbes. Retrieved June 8, 2015. ^ Rosenberg, Alyssa (June 7, 2015). "'Game of Thrones' Season 5, Episode 9 Review: "The Dance of Dragons"". Washington Post. Retrieved June 8, 2015. ^ "Game of Thrones". Emmys.com. Retrieved April 8, 2017. ^ "Hollywood Post Alliance® Announces 2015 Award Winners". Hollywood Post Alliance. November 12, 2015. Retrieved April 8, 2017. ^ Tapley, Kristopher (January 4, 2016). "'Star Wars,' 'Ant-Man,' 'Better Call Saul' Among ACE Eddie Awards Nominees". Variety. Retrieved April 8, 2017. ^ Giardina, Carolyn (February 2, 2016). "VES Awards Winners: 'Star Wars' Takes Top Prize". The Hollywood Reporter. Retrieved April 8, 2017. ^ "CSC Awards 2016". Canadian Society of Cinematographers. Retrieved April 8, 2017.